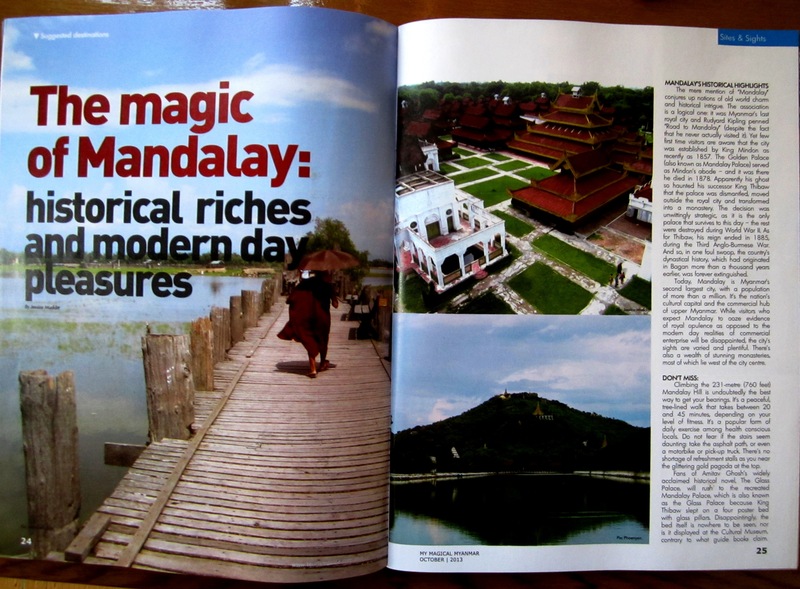 The mere mention of the word “Mandalay” conjures up notions of old world charm and historical intrigue. The association is a logical one: it was Myanmar’s last royal city and Rudyard Kipling penned “Road to Mandalay” (despite the fact that he never actually visited it). 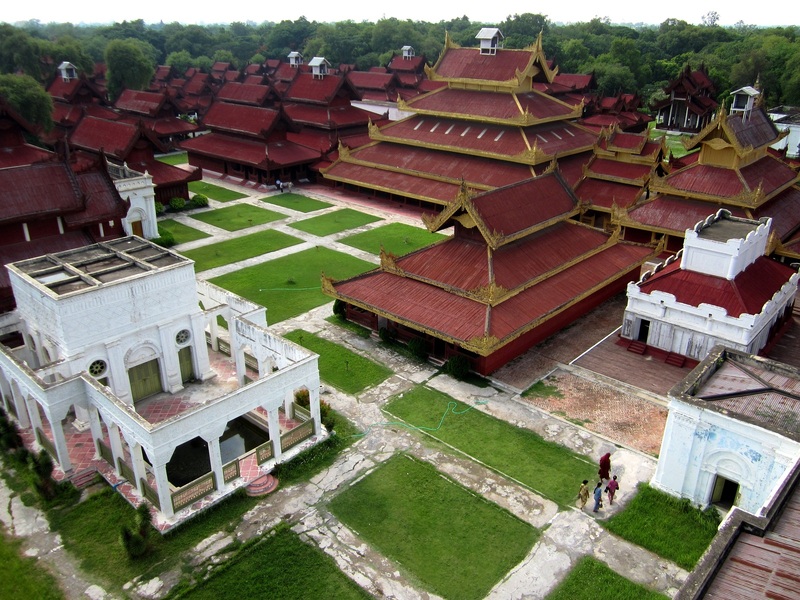 Yet few first time visitors are aware that the city was created by King Mindon as recently as 1857. The Golden Palace (also known as Mandalay Palace) served as Mindon’s abode – and it was there he died in 1878. Apparently his ghost so haunted his successor King Thibaw that it was dismantled, moved outside the royal city and transformed into a monastery. The decision was unwittingly strategic, as it is the only palace that survives to this day – the rest were destroyed during World War II. As for Thibaw, his reign ended in 1885, when Britain’s occupation began. And so, in one foul swoop, the country’s dynastical history, which originated in Bagan more than a thousand years ago, was forever extinguished. Today, Mandalay is Myanmar’s second largest city, with a population of more than a million. 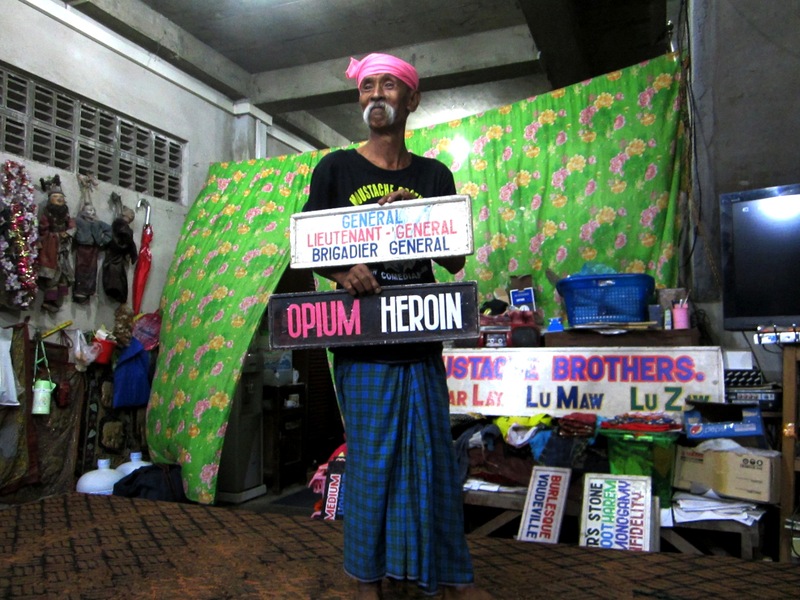 It’s the nation’s cultural capital and the commercial hub of upper Myanmar. While visitors who expect Mandalay to ooze evidence of royal opulence as opposed to the modern day realities of commercial enterprise will be disappointed, the city’s sights are varied and plentiful. There’s also a wealth of stunning monasteries, most of which lie west of the city centre. 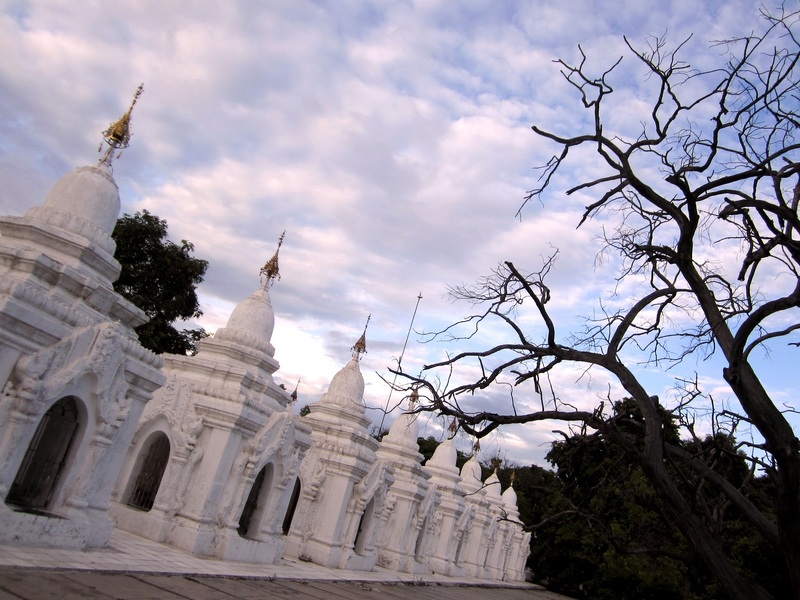 Climbing the 760 foot Mandalay Hill is undoubtedly the best way to get your bearings. It’s a peaceful, forested walk that takes between 20 and 45 minutes, depending on your level of fitness. It’s a popular form of daily exercise among health conscious locals. Do not fear if the stairs seem daunting: take the asphalt path, or even a motorbike or pick-up truck. There’s no shortage of refreshment stalls as you near the glittering gold pagoda at the top. Fans of Amitav Ghosh’s widely acclaimed historical novel, The Glass Palace, will rush to the recreated Mandalay Palace, which is also known as the Glass Palace because King Thibaw slept on a four poster bed with glass pillars. Disappointingly, the bed itself is nowhere to be seen, nor is it displayed at the Cultural Museum, contrary to what the guide books claim. Unfortunately, other than the central compound’s 40 buildings, everywhere else is out of bounds due to the presence of military encampments. While entering the palace complex, don’t let the handful of young sentries carrying semi-automatic weapons put you off, nor an enormous sign on the palace wall that states, “The tatmadaw [army] and the people cooperate and crush all those harming the union.” Tourism here is encouraged. There are photo opportunities aplenty at the marble workshops along Sagaing-Mandalay Road (west of Mahamuni paya). 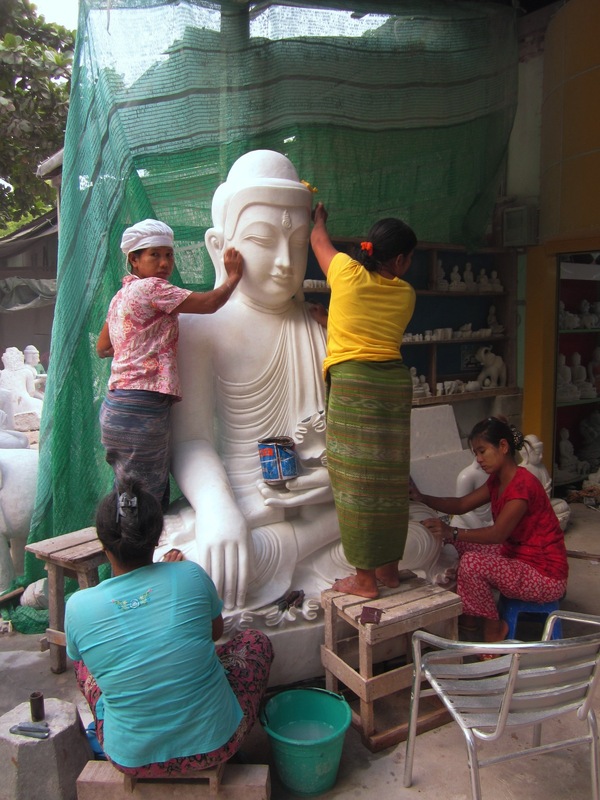 Men, women and sadly, children, blast, chip and polish enormous marble slabs into Buddhas of all sizes – it’s a curious sight to see a Buddha under construction, particularly when the head is the last part to be carved into shape. Surrounding the gilt and gold stupa of Kuthodaw Paya are 729 marble slabs inscribed with Pali script, while there’s another 1774 marble slabs at the nearby Sandamuni Paya. Together they contain the 15 books of the Buddhist canon Tripitaka. It once took 2400 monks nearly six months to recite the book from start to finish. Last year UNESCO added it to the Memory of the World Register. These a-nyeint (vaudeville) performances are famous worldwide for their brave and witty send-ups of junta rule and what they perceive as today’s ongoing corruption. Two of the three brothers served lengthy prison sentences for their jokes. Par Par Lay, the leader of the comedy trio, passed away in August. The two other Moustache Brothers – and their wives – have publicly expressed their determination to carry on the nightly performances. 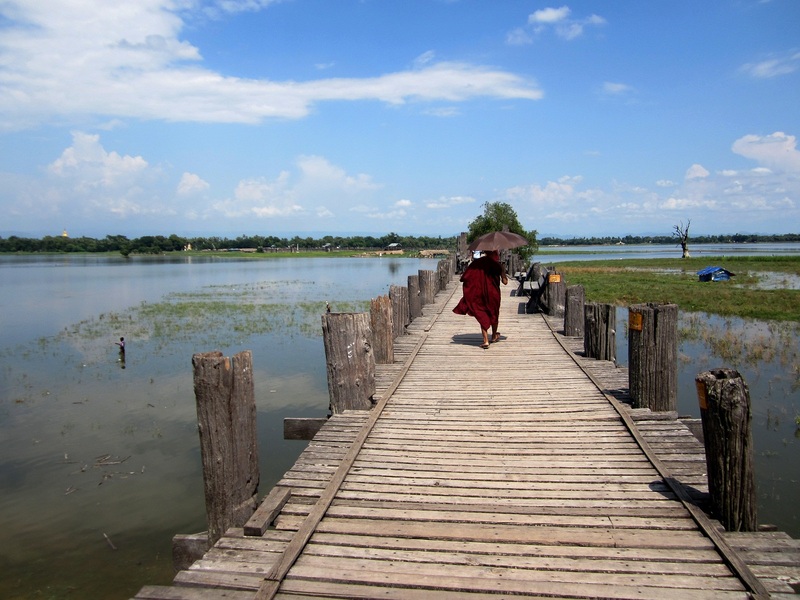 Seven miles north of Mandalay is U Bein’s Bridge, which spans 1300 yards across Amarapura’s Taungthaman Lake. Exercise caution as you traverse it – some of the planks are decidedly rickety. Contemporary artwork can be bought at a small shop on the bridge, while the nearby stalls sell stunning wood carvings at a fraction of the price you’d pay in Yangon. Hotels in and around 27th Street offer basic, air-conditioned rooms for around $30. Hotel by the Red Canal on 63rd Street is an upmarket option that gets rave reviews. Sedona Mandalay is a virtual replica of its Yangon franchise – but with the added bonus of a picturesque view of the moat. It’s on 66th Street and rooms are about $200. Hunter’s on 27th Street has the most delicious Western-style fare and is swiftly becoming the number one bar for the expat community. Koffee Korner on 70th Street serves up an impressive variety of cuisines and the decor is commendably creative. The best Myanmar fare can be found at Pakokku Daw Lay May, on 73rd Street. 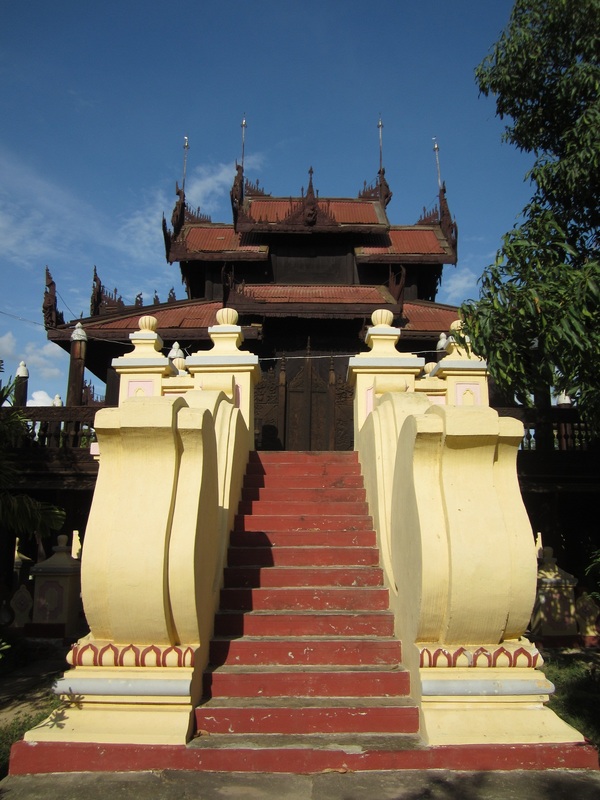 Mandalay long ago established itself as a transport hub for northern Myanmar. Trains and buses remain popular among backpackers and there’s now several domestic and even international flights available – check Air Asia’s website.